We measured 20 distances between buildings from arial views of New York City, Paris and Beijing found using Google Maps, and compared the average distance between buildings for each of these cities as well as the standard deviation of distances within a city. 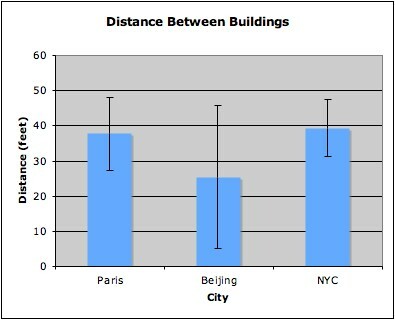 We hypothesized that Beijing would have the least distance between buildings while Paris would have the most. We also hypothesized that New York City would have the least variation in distance. Our data indicated that New York had the most distance between buildings while Beijing had the least. New York did have the lowest standard deviation of the three cities, however, none of the differences are statistically significant given that the variation among distances within the cities is larger than the variation among building distances between the cities.